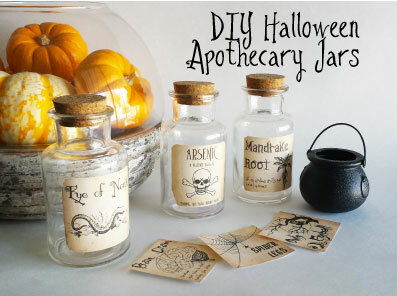 We believe there is still time to squeeze in one more Halloween DIY project and these Apothecary Jars are just the thing. We have included a free printable of the labels we designed for our jars. After printing out the labels it takes just 15 minutes to finish up this project. First you will want to download the printable( FINDS – Holiday DIY – Halloween Bottle Labels – Free Printable), print it out and then cut out each individual label. The labels measure 2.5″ square and were made to fit on corked jars we found in the dollar section at Target, but you can use any jars you wish. After cutting out each of the labels we simply used spray adhesive to attach them to the glass jars. Once they dried for a couple of minutes we took a fine sandpaper to the edges and corners to help give them a little more of an aged look. And just like that you are done!